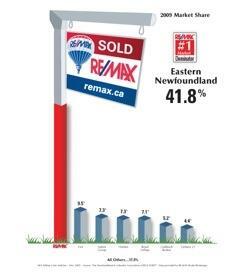 RE/MAX agents list and sell more homes by far than any other real estate agency. PERIOD. RE/MAX agents are experienced full-time sales associates, with an average of 8 years real estate experience. When you step up to a RE/MAX Top Producer, you're the one who comes out on top! RE/MAX Sales Associates have a vested interest in the homes they list. Unlike agents of other companies, whose advertising budgets are controlled by their brokers, RE/MAX Associates are free to choose what they need to spend to promote a particular property. If the home doesn't sell, the agent can actually lose money. No wonder RE/MAX Sales Associates are so determined to find the right buyers willing to pay the right price. RE/MAX Top Producers know the value of smart marketing. Through newspapers, Social Media, TV, radio, billboards and special promotions, the RE/MAX name is front and center, insuring sales for our clients and the largest selection for our buyers. The tremendous growth of RE/MAX means added service to clients and customers everywhere. Through the RE/MAX Referral System - the most effective referral service of its kind - RE/MAX Associates are able to help real estate customers who are moving to a new area find the right home before they relocate. Step Up to RE/MAX. It's a Step in the Right Direction! RE/MAX is the number one real estate organization in Canada and the United States. And the performance of RE/MAX Sales Associates everywhere is second to none. Deciding to buy or sell a home is a big step. Make sure it's a step in the right direction by choosing the person best qualified to handle your real estate needs. And take the first step toward your success.